These instructions apply only for IEEE 802.11TM Letter Ballot 101 (LB101) which is a technical vote on Draft 1.0 of the Task Group “T” amendment to the current IEEE 802.11TM standard. This is a technical letter ballot and the voter’s pool for this ballot is all IEEE 802.11 voters as of the start of the letter ballot. 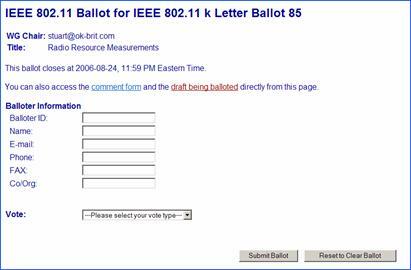 ALL VOTING MEMBERS OF IEEE 802.11 ARE REQUIRED TO VOTE ON THIS BALLOT ! Not voting on letter ballots can affect your voting privileges. IT MUST BE ACCOMPANIED BY TECHNICAL COMMENTS FOR YOUR VOTE TO BE VALID. This technical ballot opens April 16, 2007 at 23:59 Eastern Time USA and closes 30 days later on April 16, 2007 at 23:59 Eastern Time USA.